It is Located in the western wall of Al-Aqsa holy Mosque close to Alqtanin gate specifically between Rabat in the north and the Ottoman school in south. These two places are now inhabited by Jerusalemite families who are neighbors in this holy place. The Entrance of this gate takes oblong shape with a height of 3.5 m, It was renewed in the era of the Mamluk Prince Aladdin Busiri year 666 AH –1 266 m.. 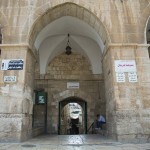 It is also called Al Metodo gate, it has taken its name from the place of ablution which conducive outside the Al-Aqsa. 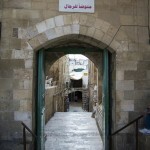 It is the only gate that does not conducive to the streets and alleys of the old city of Jerusalem , but to a private road that leads to Al Mathra which is just 50 meters.
. This antiseptic was built in the reign of Sultan Saladin Al Adel Ayoub Abu Bakr , then the Prince Aladdin Busiri had renewed it in the Mamluk period. 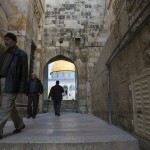 The Islamic Waqf department in Jerusalem who is in charge of Al Aqsa Mosque affairs ,has re- built it again in the eighties of the twentieth century. It is specific for men’s use now while women use disinfectant in Hutta gate. This gate is more vulnerable to the Zionism attacks because of its location which is the closest to the Dome of the Rock that is in the heart of Al-Aqsa Mosque. the most important is the tunnel which is a branch of the tunnel that runs along the western wall of the Al-Aqsa (The Zionist called (Hasmonean) tunnel ). This sub tunnel runs under the gate until the foundations of the Dome of the Rock (in the heart of Al-Aqsa Mosque. Jews called it ( Holy of Holies tunnel ) which is the tunnel of the Dome of the Rock which they consider the most sacred spot . Hundreds of Jews enter it daily to pray under Al Aqsa Mosque yards.